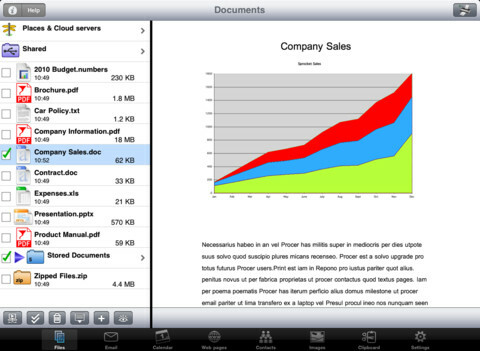 Developer Quote: "PrintCentral Pro is the essential printing app for the iPad. Print to ALL printers (not just AirPrint Printers)." Recently I upgraded my home office equipment by purchasing an HP Wireless Printer. That thing just really makes me smile. I can be downstairs and print photos upstairs. Or be in one room and send homework sheets to the printer in another. When I go to collect my papers, they are all nicely printed. Hey, what if you don't have a wireless printer though? Let's face it, there are still many who do not. It's not as though printers go bad, and you have to often run out and buy another! - Print from other Apps using "Open in"
- Open & Print files directly into PrintCentral from other apps using "Open in..."
I realize the above is a long list of features, and you may not want to check out each one. But that's exactly my point! PrintCentral Pro is a wealth of much needed options and solutions to make your personal and business work so much simpler and accessible at all times. Something else I found out is that you get help super quickly should you need it. Naturally, I had several questions on my mind. After contacting PrintCentral's help, I received an email within the hour trying to troubleshoot my questions. Help is available 24/7, folks! There is an amazingly thorough Guide which you must read just to be pleasantly surprised by all the little "gifts" this app provides. I am still checking out the manual as I love discovering new tricks. Some things I like about PrintCentral Pro are the options available when printing, such as: Paper Size, Duplex Printing, Print Orientation, Grayscale, Scale%, Cover Page (Fax cover or Print Summary), Paper Tray, and From Name. Using my iPhone's native print facility, I only have the option to choose two items: Printer and No. of copies. So, which print utility would you prefer? This is a no-brainer, isn't it! So many great features are contained here. There are tons of options built into the email app, specifically the multiple email signatures, printing and saving email and attachments to send again to someone else, mounting my iPad as a hard disk so I can comb through it, printing maps, pieces of my calendar and even texts. Well, my list of favorites is too lengthy to continue! Try PrintCentral Pro for yourself and smile in pleasure at the clever little items built in, just as I did. COOL CONCLUSION: PrintCentral Pro makes your office printing and file management so easy to handle with its wealth of options ranging from printing tools to email to file storage options straight from your iPad. --NOTE: PrintCentral Pro is also available for iPhone here.